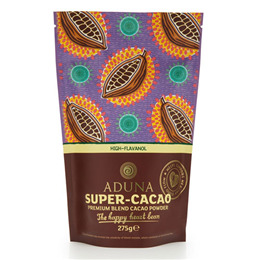 Discover Aduna Super-Cacao. This premium cacao powder contains over 8 x more flavanols than regular cacao powders thanks to specially-selected high-flavanol cacao beans and a unique gentle roasting process. Blending this cacao powder with a single-origin Ghanaian cacao ensures that each purchase makes a direct contribution to small-scale producers. No wonder we call it The Happy Heart Bean! Aduna`s Mission: Aduna is an Africa-inspired health and beauty brand and social business. We are committed to promoting exceptional and underutilised natural ingredients sourced directly from small-scale producers in Africa. Our mission is to breathe the vibrancy of Africa into the daily lives of people around the world, creating a virtuous circle which feeds positive impacts back to the source. Aduna suggest a daily dose of 2 teaspoons to support normal blood flow. 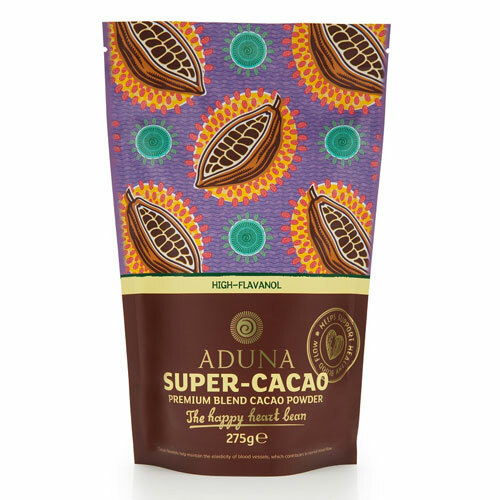 Aduna Super-Cacao has a rich, chocolatey taste that’s a tasty addition to cakes, cookies, ice creams, smoothies, shakes and more. To make a delicious drink, first mix into a paste using a small amount of liquid before topping up your glass. Below are reviews of Aduna Super-Cacao Powder - 275g by bodykind customers. If you have tried this product we'd love to hear what you think so please leave a review.